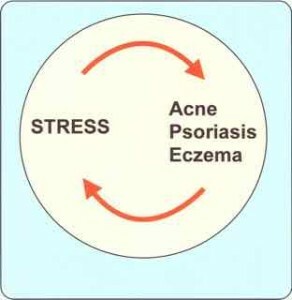 When we ask someone in clinic what seems to bring on their eczema or make it worse, almost always stress is mentioned. This is can also be the case with the other two common skin diseases, acne and psoriasis. Stress is not however seen to actually cause any of these conditions, but to exaggerate the effect of other factors, and to make treatments less effective. It is also very important to recognize that all three conditions can be stressful to have. There is a two-way relationship between stress and the skin diseases. An important stress impact of eczema includes its effect on the family. There is evidence for links at a physiological level between the mind and the skin, and these are important in understanding how stress affects eczema, and any other skin condition. For example, there is evidence that skin healing is delayed with emotional illness, and that stress can be causally associated with infection. Acute eczema seems more common for some sufferers when life is stressful, and less likely when all is well. When we are stressed and preoccupied we may be less likely to look after ourselves, less likely to be our own best friend, more likely to be our own worst enemy. When upset we can be self-neglectful, and if there is a flare-up of atopic eczema, our coping behaviour can be less than optimal. The early signs of the flare-up do not then trigger the recommended early treatment response, and the eczema becomes established and more difficult to treat. Stress can lead to scratching through in-built instinctive reflexes. Any frustration or worry can make us scratch our skin, linked with perhaps thinking about a problem, though not really helping finding a solution. Sometimes called the traffic-light phenomenon because it was first described occurring at red lights, the scratching does not speed up the change to green! If eczema flares up and is not treated promptly, the scratching that starts as a response to the associated itch can soon become complicated by the emergence of habitual, instinctive scratching. This is how acute eczema becomes chronic, requiring now The Combined Approach for successful treatment.